On one of my first forays to the desert southwest to do some reconnaissance for a youth mission trip, I found a children’s book called Coyote: A trickster tale from the American Southwest. A large blue coyote graces the cover. The story begins by telling us that Coyote had a nose for trouble, and he soon finds his way to a mesa where some crows are chanting and dancing. 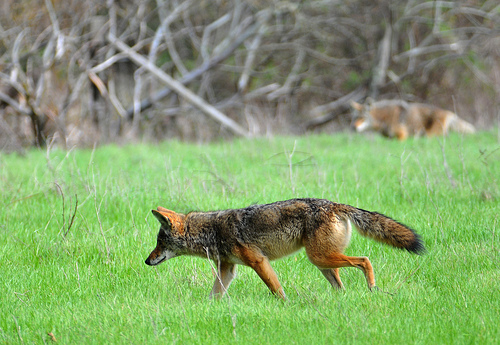 Coyote wants to dance too, so he asks old man crow if he can join them. Soon Coyote is dancing with the crows, but he makes it all about himself, and he starts getting quite proud. The crows, annoyed with him, get ready to continue their dance in the air. Coyote begs to go with them, and the old crow relents. Each crow takes a feather from their left and right wing to stick into coyote. He cries out in pain, but soon he’s flying just like the crows. Well, now he thinks he’s all that and more, and he begins bragging relentlessly. The crows have had just about enough so they take back their feathers—their trickster intent all along—and Coyote falls to the ground. His tale flames up as he falls and when he finally lands he tumbles in the dirt before he coming to a final stop, humbled and ashamed. His fur looks like it does today—dirty gray with a black-ended tail—and his bragging finally over. The trickster old crow brought that pompous blue coyote down a few notches. We didn’t hear it read this morning, but Matthew has just told us about Jesus cleansing the temple. He had come in and overturned tables, and released animals that were to be sold to pilgrims for sacrifices. He got fed up because of deceitful practices. Foreign money had to be exchanged by the pilgrims first at the temple, and the rates highly favored the sellers. Costs for the offerings resembled prices on food you buy at the airport: exorbitantly overpriced. In other words, faithful Jews who had traveled a long way to get to Jerusalem to keep their religious piety were taken advantage of, and they paid whatever was requested in order to remain faithful. So Jesus rightfully made a scene and chased out the sellers. Jesus tells them he’ll answer if they answer his question: “Did the baptism of John come from heaven, or was it of human origin?” They are wedged tightly in a solid spot with a rock blocking their escape, rhetorically speaking. They begin muttering amongst themselves. “If we say from heaven, he’ll ask why we didn’t believe him. If we say from humans, then the people will rise up against us.” “We’ll take door three,” they respond. “We don’t know.” So Jesus refuses to answer them. You can nearly see their clenched teeth as they bite out their reply. “The first,” they respond, getting it down to just two words. They know they’ve been caught, but there’s little they can do since there are people in the temple gathering around, watching this interaction take place. We hold our opinions very fiercely these days. One need only spend 10 minutes online and watch the comments section of a news story escalate. This week’s presidential “latte salute” proves the point all to well. People stick to their guns politically, theologically and in a whole host of other areas, and use social media only to restate their hardened positions or to make fun of the enemy. We talk past each other, so certain of our own beliefs and held values, and we never truly listen spending the time thinking of our next retort. The Greek word for repentance is metanoia. It literally means to change your mind or to turn around. When John the Baptist came to the River Jordan, metanoia made up thebulk of his message. Turn around. Change your mind. Repent. But the religious leaders in asking their question about authority are interested only in one thing: keeping the status quo. They want to keep their power, the lives of comfort they have created and this profit making scheme of providing offerings to pilgrims. In other words, the last thing they want to do is to change their minds. Their minds are made up, thank you very much. Yes they claim they want to please God, their lips know all the right words, “I go, sir” they say. But their hearts and their actions do not reflect their statements at all. They stand off in the distance casting judgmental looks on any and all. So when Jesus bobs and weaves like he does in this text, I cannot help but think of it as another trickster tale. Jesus sees the arrogance, the self-centeredness of those religious types and sets out to show it to them. But Jesus continues to be wily, because as soon as we join him on the side of denouncing those haughty chief priests and elders, we run the risk of becoming the haughty ones ourselves. When we respond to others who have taken up hardened positions with our own hardened positions, we are no better. Jesus, ever playing the trickster here, slides out of our grasp on him too. He doesn’t want us to take up the role of judge, but rather to focus on ourselves and our own lives. He wants us to change our minds and turn around too. He wants us to repent. Which is, I think, what he really wants for those chief priests and elders. While this story takes on many aspects of the trickster tale, I think Jesus doesn’t want to make the religious authorities to look foolish simply to criticize them, but he also wants them to have a change in heart. He wants them to see that the hardened positions they have taken, the authority they have relished in and abused, only push them further away from God. Jesus longs for them to repent. But they won’t. They do not change their minds. The neither believe John the Baptist nor Jesus. They cannot see how tax collectors and prostitutes could ever be considered righteous. So they stay right where they are, hearts cold and stony with anger seething in them. What will it take for you to change your mind? What beliefs about God and our world do hold onto so dearly that you refuse to see the work of Jesus in others? How have we pigeon-holed Jesus ourselves to act only as we expect? Who is it that we cannot ever imagine receiving the grace of God? How do we close off God’s grace in our own lives? Jesus stands before us offering the gift of abundant life that comes when we change our minds, turn around, and repent. He isn’t out to trick us, but invites us beyond the status quo to grace and acceptance and love. It will mean letting go of some of our tightly held beliefs about God, but when we open ourselves up we discover that we are more deeply loved than we could ever have imagined. Amen.